Hey there. Great looking game nice simple game-play but I first encountered a bug at the very start when I picked up the first piece of fruit and then tried to put it in the pit. The dialog got stuck in a loop where it would say press k ( with no dialog bubble) , I would, then the dialog bubble would flash for a split second and after it disappeared the controls were still locked. I could hit K again and the bug loop would start again with the controls never being unlocked. I had to restart the game. 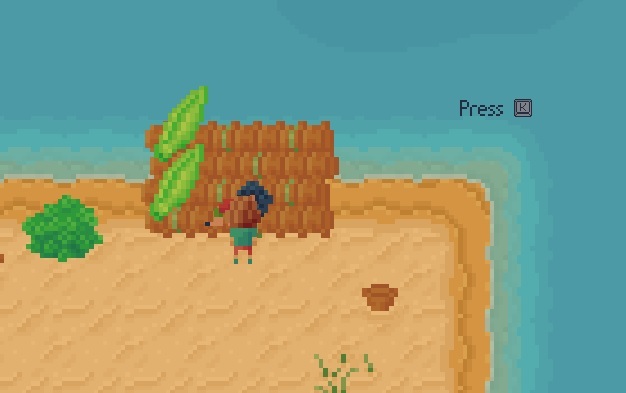 I enjoyed the game collecting all the pickups I could and when I was back at the starting Island I talked to the woman making the raft and after her dialog was done I was stuck in the same bug loop I described with the pit where the controls locked up except for the k button that just restarted the buggy dialog loop. Just thought I'd let you know, so you could fix this. Really great art in your game!